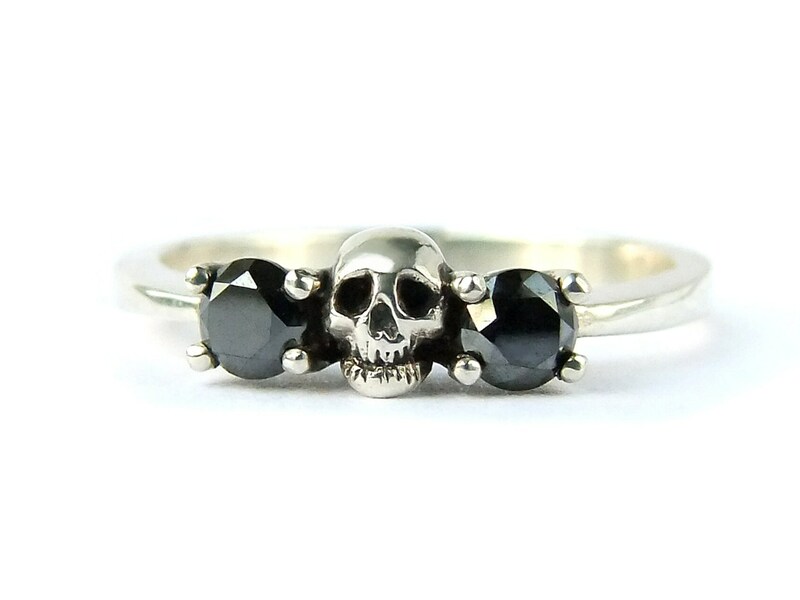 The perfect scary skull wedding ring with diamonds for your dark bride! 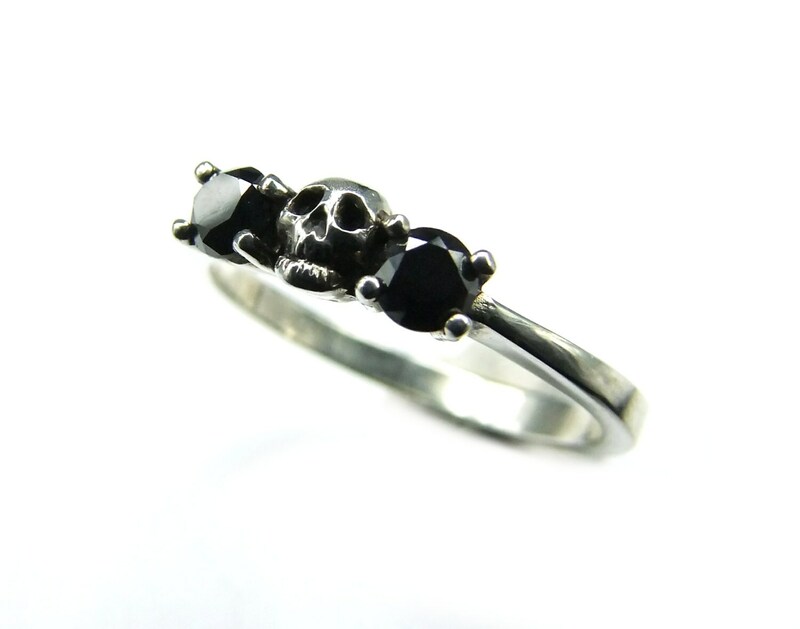 One little hand carved skull is accompaigned by black diamonds and white sapphires. The skull measures 5mm. Its a slender wedding band 4mm wide, made of massive 14k palladium white gold. The stones measure 3.5mm and are claw set. 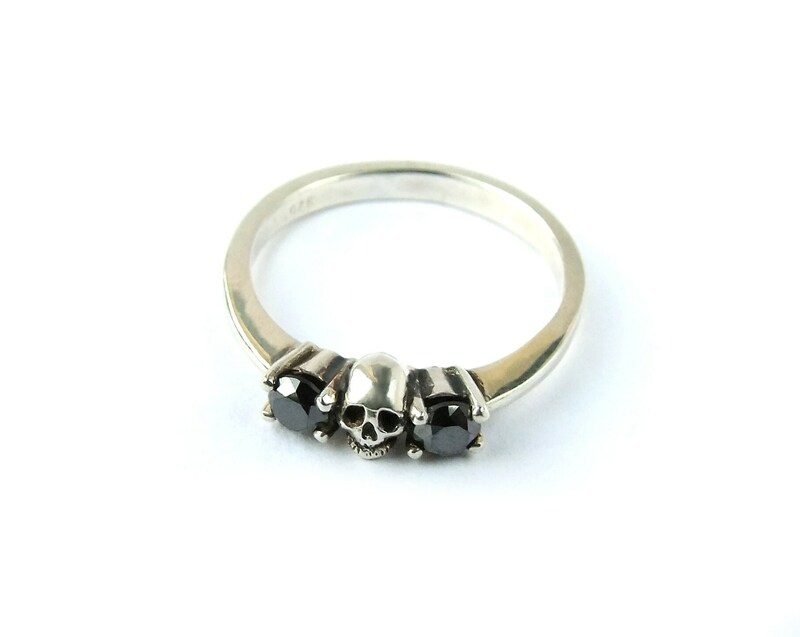 Im offering this ring also in any other gold alloy, like black gold or yellow gold. Every ring is custom made for you in your size. The ring comes in a luxury wooden box per express delivery. Choose your size during checkout - please, make sure it got measured properly by a jeweler or at home by a sliding calliper. Find instructions in my FAQ. You get your coupon code in the confirmation email. ♦ I use only conflict free stones and recycled metals. If you need the ring by a specific date please leave me a note with your order. Depending on order situation faster processing can be made possible. 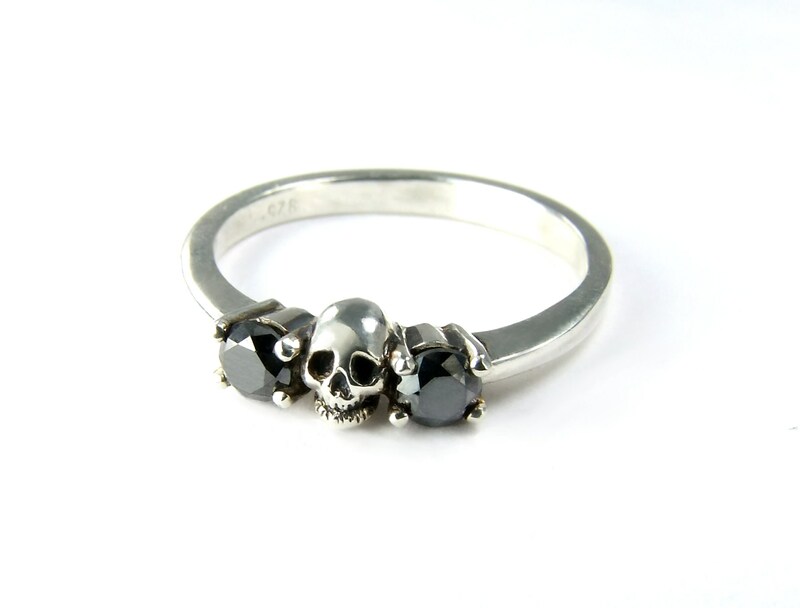 This ring is custom made, so please allow 3-4 weeks for manufacture. Convo me if you need help. I can practically work with every scale in which rings are measured. No matter if EU, UK or US sizes. Inner diameter is fine, too. - BUT make sure it was measured properly by a jeweler or at home by a sliding calliper. Strings, paper strips or rulers are not exact enough to measure your ring size! I tell you to avoid unnecessary shipping back and forth. Be assured to get exactly the size you order. In my "Ready to ship" section you find different models in different sizes which are ready made and ready to ship. All other listings are made to order. Processing time is 3-4 weeks, then they will be shipped. Dont forget to add estimated shipping time to your area, to know, when your order will actually be with you. If you need it sooner, please contact me. Depending on needed size and order situation i might be able to speed it up. For real rush orders im charging 20% of total price. Expedited shipping takes to - EU 24h, US 48h, AUS 72h. Choose this option during check-out and please, PROVIDE YOUR PHONE NUMBER. Its mandatory, so the carrier can schedule delivery with you. Payment plans - No problem! To set up your personal plan I need to know which model and stone you want, the size youd need and what would be a convenient amount for you to pay per installment. Id apprechiate an initial payment quite soon to confirm your will to purchase. This will be done via custom listing. Convo me for yours. The other payments will be set up as a reserved listing in the quantity of your installments. You may purchase as many of them as you want whenever you feel like. No interest charged. I will send you a link to your reserved listing, from that one you can purchase over and over until its yours. Your item will be processed as soon as the total price is fully paid. Until then all installments are refundable. Im a small, highly skilled german business. I value my work and that of others, so i see no point in price dumping at any part of the process or in material. Lower price means lower quality. Always. What im offering to you is high end jewelry. Its neither thin nor lightweight, even though its dainty. For a new model im making a prototype from scratch in sterling silver. 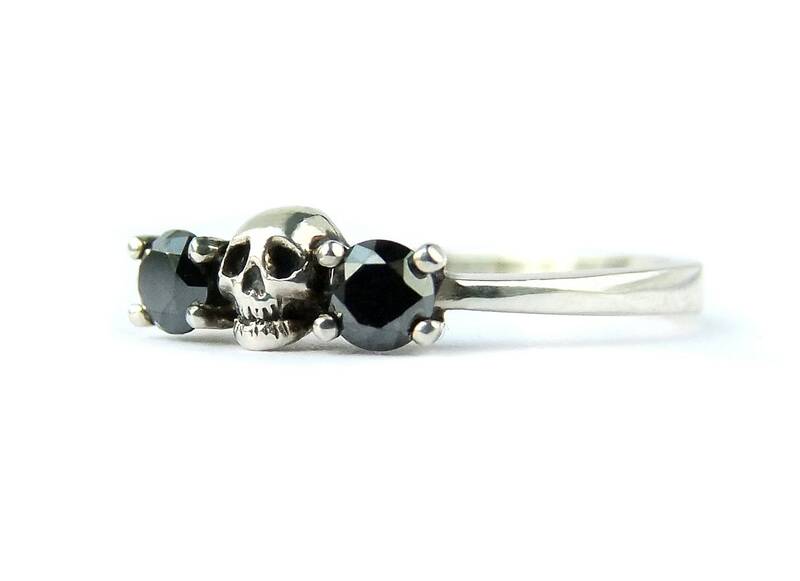 Means carving skulls, bending and shaping the band, making the settings and a thousand other little steps to bring out a very special ring. This takes around 20-50 hours of work. All rings are polished by hand, to keep the details. Thats is a time consuming process, which requires professional skills and patience. Goldsmithing is an ancient craft to make things which last. How to find out my partner's size without asking? Are these real natural stones? I prefer to work with precious natural gemstones, from which im only using the best quality on the market. Certainly, that is reflected in my prices. Also my diamonds are all natural. Wherever you read "natural diamond" or "nat dia" its EXACTLY that - natural, conflict free diamonds. But due to customer request im also offering some imitations. You can easily spot them in listings and variations. If you read "lab diamond/ruby/whatever" then its a man made stone. All others are perfectly natural and real. Im working only with reputable german stone traders. 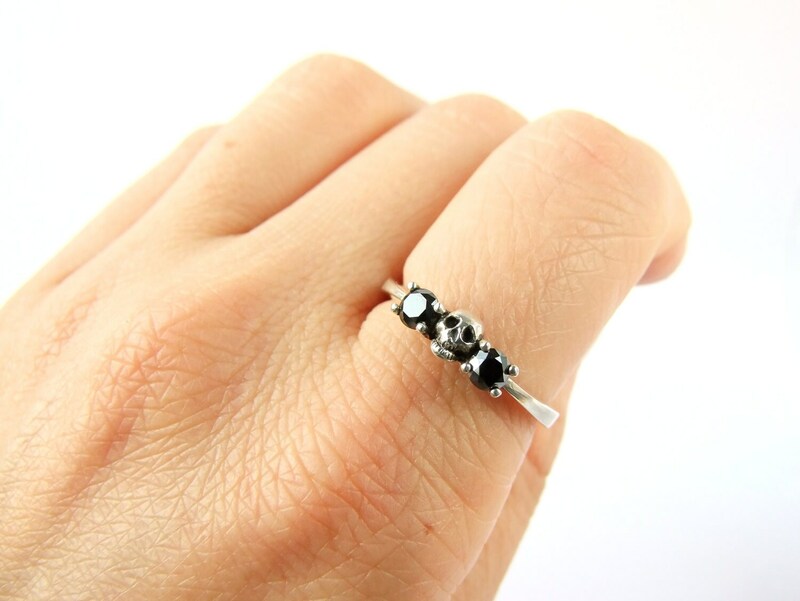 As diamond imitations im using cubic zirconia for small stones and black moissanite for the big ones. When you choose "Expedited shipping" during checkout, that means your item will be with you 2-3 workdays (depending on your location) after it is completed. This option has no influence on processing time. It takes usually 3-4 weeks to complete a custom made item. Please, contact me, if you need a made to order item on a specific date. Only items from my "Ready to Ship" section will be with you within 3-4 workdays. (1) The following business terms are applicable to all the contracts which you conclude with us as a supplier (Christine Kipka) via the etsy Internet platform. Unless otherwise agreed upon, the inclusion, if necessary, of your own conditions is ruled out. (2) If we set up an item vis-a-vis etsy, the activation of the supply-side domain at etsy encompasses the binding offer associated with the conclusion of a purchase contract under the conditions specified on the page associated with the item in question. The products intended for purchase are moved to the "shopping cart". You can select the "shopping cart" using the appropriate buttons on the navigation bar and make changes there at any time. After selecting the payment method and selecting "proceed to checkout" or "pay with PayPal", personal information and payment data is entered. Finally, all of the order data is shown again on the order summary page. If you use an upfront payment system (e.g. Paypal or Sofortüberweisung), you will initially be transferred to the website of the payment system provider. Finally, you will be routed back to Etsy on the order summary page. Before submitting the order, you have the ability once more to review or change any information on the order summary page (you may also use the "back" button on the Internet browser), or to cancel the purchase. By clicking the appropriate button to submit the order, you declare acceptance of the order in a legally binding way by which the purchase agreement takes place. (1) You are to use the on-line ordering system to provide us with the respective details, texts or files that are necessary for the customised designing of the products in question. This can also be done via e-mail, in which case it must be done in a prompt manner after the contract has been concluded. Any potential specifications issued by the supplier regarding file formats are to be borne in mind. (4) Insofar as such a provision is specified in the product description, you shall receive a correction template from us, which you should check in a prompt manner. If you approve of the design, you are to approve the correction template for execution through a counter-signature in text format (e.g. e-mail). Tasks related to the creation of the product in question are not carried out without your approval. You are responsible for checking the correction template for accuracy and completeness and bringing any potential errors to our attention. We assume no liability for unqueried errors. The European Commission provides a platform for the out-of-court resolution of disputes (ODR platform), which can be viewed under ec.europa.eu/odr. 3.2 The complete text of the contract is not saved with us. Before the order is sent, the contract data can be printed out or electronically saved using the browser’s print function. After the order is received by us, the order data, the legally-mandated details related to distance selling contracts and the standard business terms are re-sent to you via e-mail. Unless a different period is specified in the item description or our delivery conditions, the goods are delivered within 3-5 days after the conclusion of the contract (in case an advance payment has been agreed upon, after the payment authorisation). In order to exercise your revocation right, you must inform us (Christine Kipka, Holbeinstraße 85, 04229 Leipzig, Telephone number: 004916093031014, E-Mail address: kipkalinka@gmx.net) of your decision to revoke this contract by means of a clear declaration (e.g. a letter sent via post, fax or email). 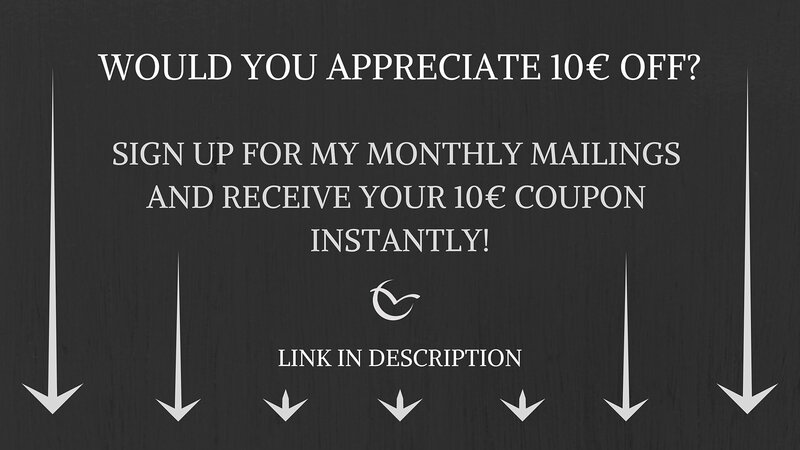 You can use the enclosed specimen revocation form for this, which however is not mandatory. (1) Die nachstehenden Geschäftsbedingungen gelten für alle Verträge, die Sie mit uns als Anbieter (Christine Kipka) über die Internetplattform etsy schließen. Soweit nicht anders vereinbart, wird der Einbeziehung gegebenenfalls von Ihnen verwendeter eigener Bedingungen widersprochen. Um Ihr Widerrufsrecht auszuüben, müssen Sie uns (Christine Kipka, Holbeinstraße 85, 04229 Leipzig, Telefonnummer: 004916093031014, E-Mail-Adresse: kipkalinka@gmx.net) mittels einer eindeutigen Erklärung (z.B. ein mit der Post versandter Brief, Telefax oder E-Mail) über Ihren Entschluss, diesen Vertrag zu widerrufen, informieren. Sie können dafür das beigefügte Muster-Widerrufsformular verwenden, das jedoch nicht vorgeschrieben ist.